Contrary to popular belief, timber windows can provide you with high levels of energy efficiency. Make your home more comfortable to live in and help reduce energy bills by upgrading the thermal efficiency of your windows and doors. Using the BFRC’s (British Fenestration Rating Council) scale, our timber windows can provide more than adequate levels of thermal efficiency. Designed to improve the energy performance of buildings, the BFRC’s scale ranges from A-G, with G being the worst performing energy grading, and A the best. All timber windows from High Performance Windows are able to achieve A-C Window Energy Ratings (WERs), which more than exceeds current requirements for both replacement and new window installations. Our timber effect Residence 9 range of windows also more than meet the ratings required for new build and replacement projects (with Residence 9 able to achieve up to an ‘A’), as their unique 9 chambered system offers outstanding levels of thermal efficiency. When incorporating appropriate glazing, both our timber and timber effect products are able to provide excellent levels of energy efficiency – keeping your home warm on the inside by insulating it from cold weather outside. 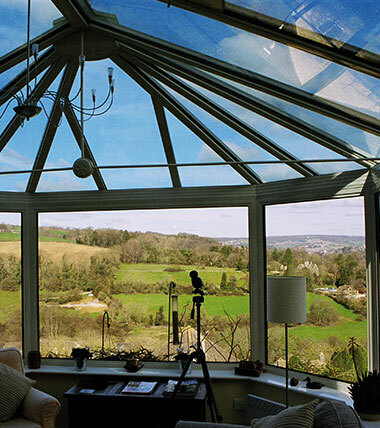 Our bi-fold doors, conservatories and orangeries offer a choice of Argon filled glazing units which can offer excellent levels of energy efficiency by reducing the effects of thermal conductivity compared with regular gasses – an initial investment that will contribute to lower energy bills in the long term.